Germany has re-launched their new LGBT for Germany website – which includes details of the LGBT scene in the major cities, as well as showcasing the country’s best art and architecture too. It’s hard to believe that it has been 25 years since the reunification of Germany. I can vividly remember seeing the Berlin Wall being torn down on the television; it’s hard to forget such monumentous events. As well as signalling the end of the Cold War this was also a beginning too though. A new reunified Germany was getting ready to rebuild itself and with some pretty radical results as I found out. Architecture has always mirrored the political and social ideology of the time in which it was built and the events of 1989 inspired a new wave of enlightened and positive German construction. 25 years on I decided to take a look at some of the iconic landmarks that were inspired by the optimism surrounding German reunification. Perhaps the most historically significant of these is Berlins renovated Reichstag which housed Germany’s Parliament from 1894 until it was destroyed by a fire 1933. The home of Germany’s demo cracy stood derelict and forlorn (rather symbolically) for years right on the boundary between East and West Berlin until it was renovated during the 1960s. 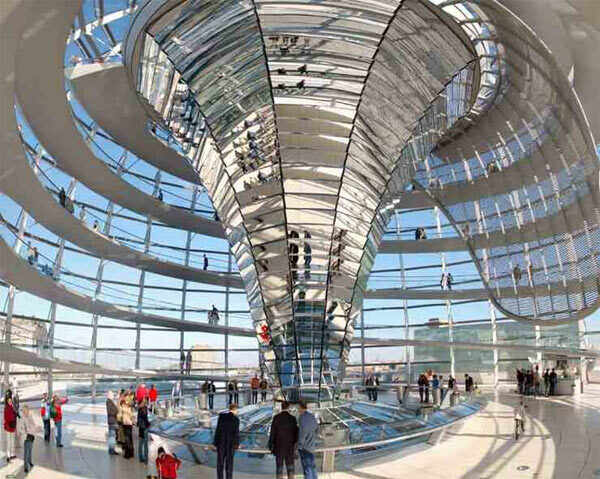 In 1990 a buoyant Germany held the official reunification ceremony here, but it was the subsequent renovation by Norman Foster for which the building is now widely recognised. You can’t help but notice the new Reichstag building, virtually all that is left of the original building is the ornate facade, but it is Sir Norman’s glass dome which really grabs your attention, especially at night when it glows on top of the building. This gleaming metal and glass structure comes complete with a ramp which spirals around the outside of the dome giving unparalleled views of the Berlin Sky line. The dome overlooks the debating chamber for the Bundestag, a design feature which focuses on making the process of government more transparent. Perhaps our own government should be taking note and well they might, the design strongly influenced Fosters design for London’s county hall on the South Bank. Foster is far from the only brilliant architect to be invited to come and strut his stuff in Germany though. Frank Gehry’s unique style of deconstructionism has been responsible for the Guggenheim Museum in Bilbao and LA’s Walt Disney Concert Hall. His equally eccentric contributions to the German skyline can be seen both in Hamburg and on Düsseldorf’s waterfront where three buildings collectively known as Der Neue Zollhof stand. These office blocks trick the eye from a distance challenging both perception and perspective. They are wavy undulating creations that lack any conventional form and are both playful and funky at the same time, you could be forgiven for thinking that they had slipped right of the pages of a Manga comic book. Conventional these buildings are not but I like them, so much more interesting than the angular, uniform office spaces you see in so many other cities. If Gehry’s buildings are funky then Iraqi born architect Zaha Hadid’s brand of deconstructionism on show at the Phaeno Science Center in Wolfsburg defines hip, in fact it’s positively groovadelic. The centre resembles some huge off-worldy leviathan that has made an unscheduled stop for some reason in Lower Saxony. So fascinating is this building that I defy anyone not to want to explore further, and this is where the fun really starts. The inside spaces are as futuristic as the science exhibits it houses, this structure just gets ‘curioser and curioser’. I have only just scratched the surface of some of Germany’s Innovative and forward thinking buildings here, but it’s great to see so much humour and pioneering spirit in some outstanding design. Great buildings need inspiration I suppose and it would seem that in the last 20 years Germany has provided that in spades, and the results are right here for everyone to see.